Original Arduino boards are uncertified ? Since the board comes from a trusted distributor (Lextronic), I was pretty surprised! arduino.cc, where I downloaded the Arduino IDE. They use the Arduino™ logo. arduino.org, which manufactured my "original made in Italy" board. They use the Arduino ® logo. Their board can also be recognized by the Vendor ID 0x2A03. I made a side-by-side picture comparison of the boards, using photos from the respective websites (the logo difference is particularly small: click to see it fullscreen). How subtle! But behind this surprisingly minor cosmetic difference, I found a good report of the present situation (as of March 2015) in this article: http://hackaday.com/2015/03/12/arduino-v-arduino-part-ii/. It seems things are getting tensed (trademark lawsuits). I shouldn't forget to say that, apart from the annoyingly frightening warning message, my "uncertified" board from arduino.org is in perfect condition and works perfectly with the current arduino.cc IDE! It's sad that probably many people will get bitten by this quite misleading message in the coming months. 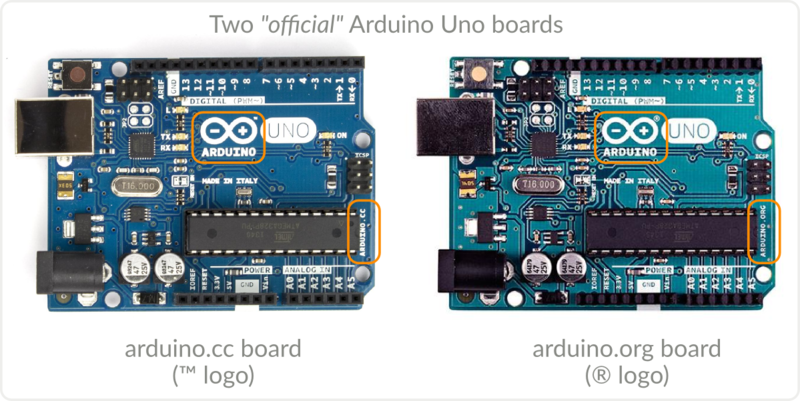 Author pierrePosted on April 7, 2015 April 7, 2015 Categories UncategorizedTags arduino, microcontroller1 Comment on Original Arduino boards are uncertified ?